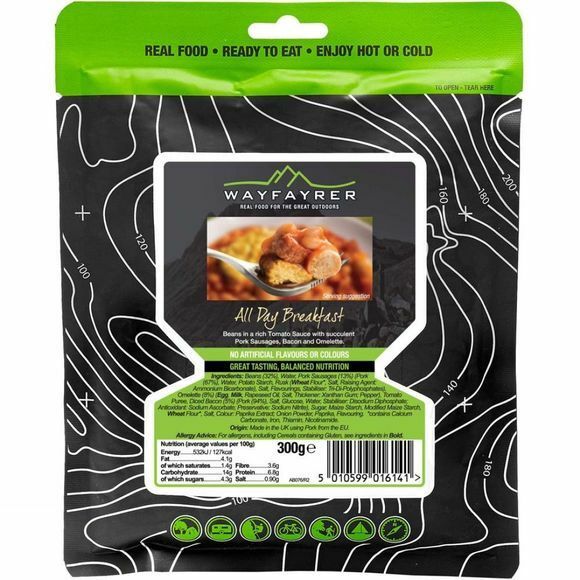 The All Day Breakfast from Wayfayrer is ready cooked so you just need to heat it through (or eat it cold if needs be), with a long life span so if you don't eat on this trip, it'll probably be okay for your next. It's also packed in a flexible pouch so it's more rucksack-friendly than a tin, and to top it all off, it's delicious! 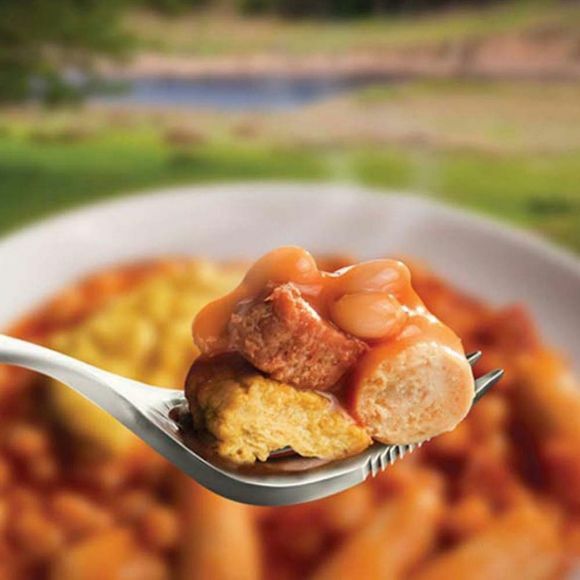 Beans (32%), Water, Pork Sausages (12%) (Pork (65%), Water, Rusk (Wheat Flour (contains Calcium Carbonate, Iron, Thiamin, Nicotinamide), Salt, Raising Agent: (E503(ii)), Salt, Pork Rind, Spice Extract, Stabiliser: Calcium Lactate; Spices, Mustard Flour, Sage), Omelette (8%) (Egg, Milk, Rapseed Oil, Salt, Thickener: Xanthan Gum; Pepper), Tomato Puree, Diced Bacon (5%) (Pork (94%), Salt, Glucose, Water, Stabiliser: Disodium Diphosphate; Anti-oxidant: Sodium Ascorbate; Preservatives: Sodium Nitrite), Sugar, Maize Starch, Modified Maize Starch, Wheat Flour, Salt, Colour: Paprika Extract; Onion Powder, Paprika, Flavouring.